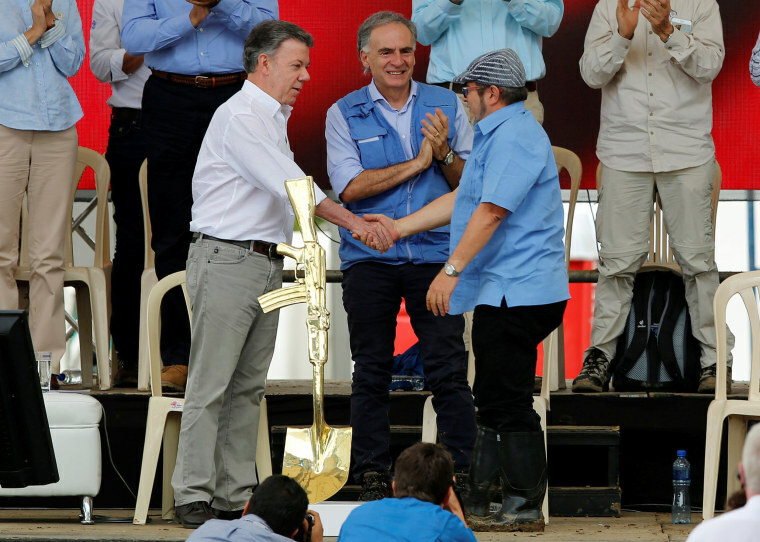 MESETAS, Colombia — Colombia's Marxist FARC rebels concluded their disarmament on Tuesday, handing in all but a few of their individual weapons to the United Nations and ending their role in a half-century war that killed more than 220,000 and displaced millions. The Revolutionary Armed Forces of Colombia, known as FARC, turned in the remaining 40 percent of their firearms in Mesetas, a mountainous area in southeastern Colombia. The roughly 7,000 former fighters have pledged to continue their struggle as a political movement. The 7,132 weapons will be stored in containers until they are molded into a monument for peace. Explosives and bigger weapons are being cleared from caches nationwide and a few guns will remain for security at 26 camps until they close on Aug. 1. "Today doesn't end the existence of the FARC, it ends our armed struggle," said Rodrigo Londono, the FARC's top commander, who goes by his nom de guerre Timochenko. "Farewell to arms, farewell to war, welcome to peace." Financed by drug trafficking, kidnapping for ransom and extortion, the FARC had about 17,000 combatants in the 1990s, capable of launching military attacks close to Bogota, the capital. But the rebel group that began in 1964 as a peasant army demanding agrarian reform was battered deep into Colombia's inhospitable jungles by a relentless military offensive that began in 2002 during Alvaro Uribe's presidency. The U.S.-backed campaign improved security and helped the nation of 49 million people, once considered nearly a failed state, lure back investors and tourists. Rich in commodities like oil, coal, gold and coffee, it is one of Washington's closest allies in Latin America and has a long history of market-friendly governments. "Today is a very special day, the day weapons became words ... I can say from the bottom of my heart that to live this day, to achieve this day, has made worthwhile being president of Colombia," said President Juan Manuel Santos, who was awarded the Nobel Peace Prize in 2016. "Our peace is real, and it's irreversible." Although the government promises to provide protection, the FARC is concerned about security. Thousands of former guerrillas were assassinated by paramilitaries after joining a political party during a peace attempt in the 1980s. Santos, who took office in 2010, began secret talks with FARC commanders that led to negotiations in Cuba and a final peace accord late last year. He is trying for a similar accord with the National Liberation Army (ELN). Peace with the FARC, however, is unlikely to end violence in Colombia as the lucrative cocaine business has given rise to criminal gangs and traffickers.